Beginning T-SQL begins with an introduction to databases, normalization, and to SQL Server Management Studio. Attention is given to Azure SQL Database and how to connect to remote databases in the cloud. 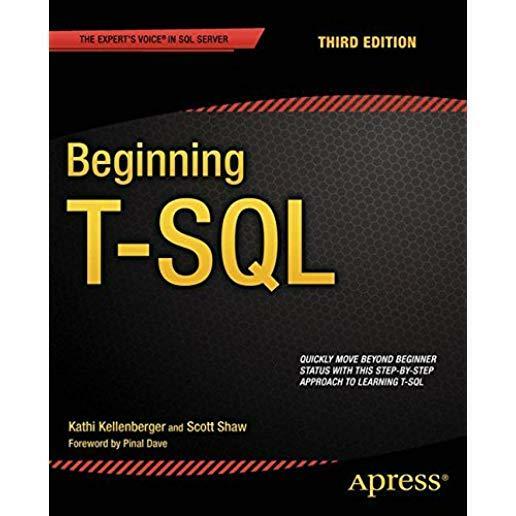 Each subsequent chapter teaches an aspect of T-SQL, building on the skills learned in previous chapters. Exercises in most chapters provide an opportunity for the hands-on practice that leads to true learning and distinguishes the competent professional. Important techniques such as windowing functions are covered to help write fast executing queries that solve real business problems. A stand-out feature in this book is that most chapters end with a "Thinking About Performance" section. These sections cover aspects of query performance relative to the content just presented. They'll help you avoid beginner mistakes by knowing about and thinking about performance from Day 1.